Penn 8th at America Trophy, Going to Nationals! 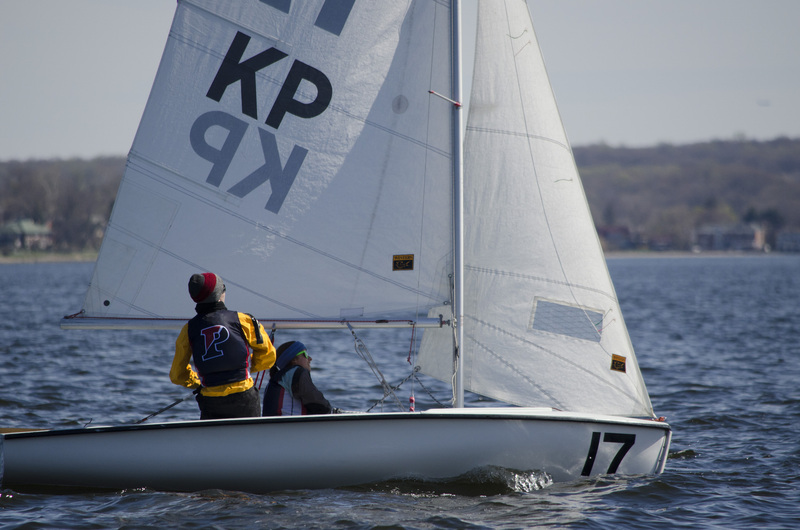 For the second time this spring, the Penn Sailing Team piled itself into a vehicle to travel 5 hours south to Norfolk Virginia. However, this time was different – there was much more riding on the outcome of this weekend’s event, and we brought a much bigger team with us. The Quakers in the car included Jack Swikart, Drew Gallagher, Keen Butcher, Catie Hopkins, Patricia Andrade, Lucy Sergeant and coach Billy Martin, and they were headed to the America Trophy, the final test for the Mid-Atlantic conference and the qualifier for Nationals. 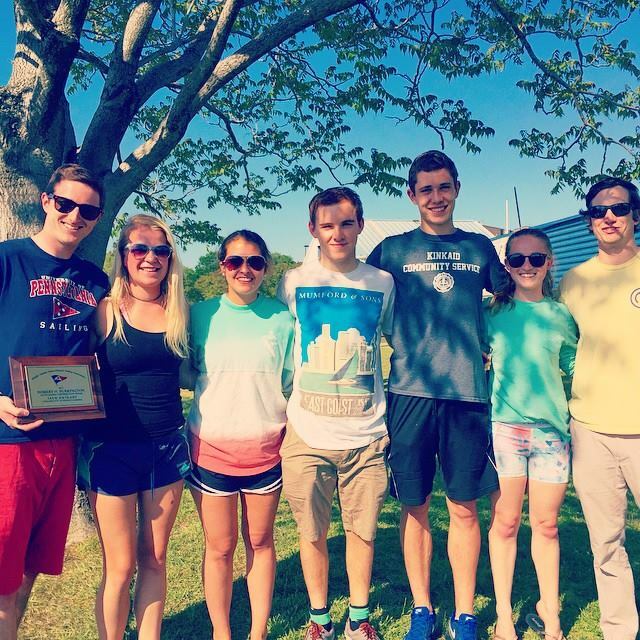 This year, the top 9 teams would make it and get the opportunity to travel to Newport, RI for Coed Semifinals. After an eventful ride down, the team got a good night’s rest before day 1 of the event. Catie and I started in A Division while Drew and Pati started in B. The breeze on Saturday was light-to-medium but reasonably steady (at least at first). Catie and I sailed to a 12, 9 while Drew did even better with a 6, 4; so after one set (2 races in each division) we were in good shape in 7th place. However, we knew we had to stay consistent because the series might not be more than 6-8 races total given the forecast for light air all weekend. While that is a strong point for our team, not having enough races can doom any squad, but we were ready. Catie and I went out and had our strongest set of the regatta with a 1, 2 before handing things back to Drew. Unfortunately a combination of being early at the start and untimely fouls caused Drew to suffer an 18, 11, but even with those finishes we were still in good shape. After all, at a conference championship everyone is bound to make mistakes. Catie and I took to the water again in a dying breeze to attempt more races, and despite making countless mistakes of our own managed to come up with a reasonably consistent 13, 8. Although the race committee sent B Division out for their next set, the wind simply would not cooperate, and forced us to end the day there. After 6 A races and 4 B races, we were uncomfortably in 9th place, a mere 4 points in front of 10th. After a good dinner we got back to the hotel and skipped the Mayweather/Pacquiao fight in order to get our rest. Sunday came with conditions just like the forecast had called for – a dying breeze that made Saturday look like ideal conditions. Luckily they were able to quickly get off races 5B and 6B, in which Drew and Pati managed a consistent 6, 9 scoreline putting us in 8th with a 7 point cushion over Hobart, the 9th place team. Catie and I went out again in truly marginal conditions and had another great set – with our 9, 2 we were tied for 4th in A Division. However, these races and scores are to be lost to history, since the breeze shut off and did not fully return. While the RC attempted race 7B multiple times, there was never enough wind to finish it. Thus, the two A Division scores we got were thrown out, but on the bright side we had qualified for Nationals again! At the awards, new captain Catie Hopkins was honored as an All-MAISA crew for the year and is the first Penn sailor to receive that honor. Mac Agnese was honored as an All-Conference skipper last year, but Catie is our first All-MAISA Crew. Congratulations Catie! Also at the awards, I was honored with the Robert H. Purrington Award for Student Leadership and Service. The award is given to the senior in MAISA who embodies both leadership and service both on their team and in the conference. It’s been a privilege to be the captain of the Penn team for two years as well as the undergraduate president of MAISA this past year, and it was nice to receive recognition from the conference leadership. Now the team will dive into exams before beginning preparations for Nationals in June! The team hopes to improve on its performance last year at St. Mary’s by making the national finals. See you all in Newport! 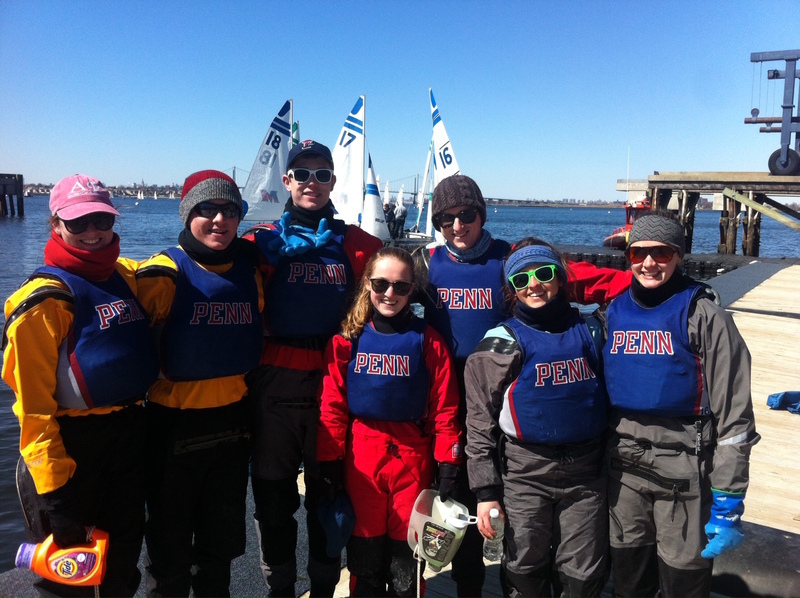 Penn Sailing Takes 5th at Admiral’s Cup! Friday afternoon marked a historic time for the Penn Sailing team, as we took the first ever “van selfie” en route to the Admiral’s Cup at King’s Point. Jack proudly proclaimed, “this is the first time in the age of camera phones that the team has had a van as transport to a regatta.” With this proud moment in mind, and Coach Billy at the wheel, we made the drive to Drew’s house. Saturday morning we arrived at King’s Point to 12-15 knots, with Jack and me in A Division in the FJ, Pati and Drew in B Division in the 420, and Keen in C Division in the laser. The morning wind allowed us to each finish 4 solid races before heading in for lunch. After our lunch break, Catie subbed in as Jack’s crew, as the wind decreased to around 5-8 knots. Billy and the sailors not currently racing intently observed the racing from a motor boat. We also came up with a way to wager on the racing, in the form of pushups. Each race, each of us would choose a boat to bet on, and then have to do the number of pushups of the place the boat finished in. Later in the afternoon, the wind direction was extremely shifty, and dead at times, making it very difficult to finish races. Many races were abandoned in each fleet throughout the afternoon. By 4 o’clock and with a lack of any steady wind, we headed in to de-rig. On Saturday night the entire team was treated to a homemade taco dinner courtesy of Mrs. Gallagher. After dinner, fitness was still on the team’s mind as we dealt out a deck of cards, with each person having to do pushups in the amount on the card. With hundreds of pushups under many of our belts, we headed to bed early to rest up for Sunday. Sunday morning brought steady wind early on, and each fleet was able to get off a few solid races. By the time we took a break for lunch though, the wind became too light to race. After a few hours spent waiting to see if it would fill in, playing a little bit of football, and a lot of lounging, we were informed racing was over. Even with the many delays and lack of wind, this was a great weekend for the team. We finished fifth out of a strong fleet of 20! 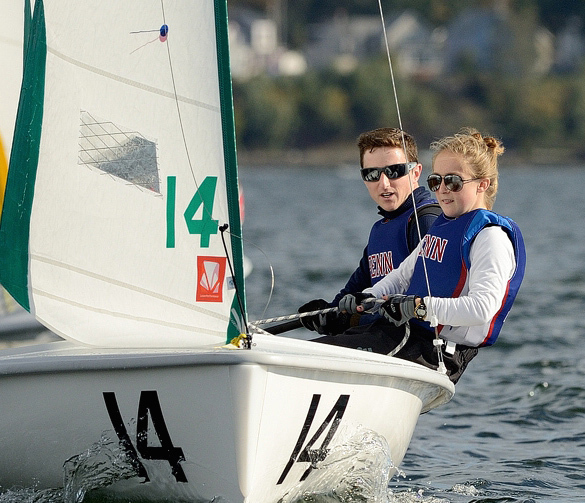 It was a fun regatta, and a great way to head into America’s trophy next weekend. Thanks to the Gallaghers for hosting us again, and to Billy for driving our 12-passenger van! After a relaxing Fling Friday, Jack Swikart, Foster Collins, Max Joyce and I headed down to Annapolis, excited for the next few days of competitive racing. We headed to dinner in downtown Annapolis and then travelled the last few minutes to the Harding’s house, our home base for the weekend. After some ice cream (me) and video games (the boys), we headed to bed, excited for Naval Bagels in the morning. Saturday was a spectacular spring day in Annapolis, with light breeze and temperatures reaching 80. Jack and I started in A Division in the Z420s and Max and Foster took on the B Division FJs. Jack and I came out of the gate strong, winning the first race (with a little luck involved). We managed to get through a few races in the light breeze before a lunch break, and after a brief onshore postponement, we went back out and got in a few more races before the breeze died again. After another postponement, we headed all the way out to the mouth of the river and managed to squeeze out a few more races. After a great dinner at the Naval Academy, and another great dinner at the Harding’s, we went to bed with an eye on the forecasted breeze for Sunday. Sunday was significantly windier and colder than the day before, and the Race Committee wasted no time in getting our day started. The morning breeze was only 8-12 knots, but it picked up quite a bit throughout the day, leaving us to work hard to keep the boat flat. Foster and Max worked to get the hang of the Z420 in breeze, with much more of a side advantage than Saturday, while Jack and I worked hard to keep the FJ under control as the breeze built up to 15-20 knots by the end of the day. By the afternoon, we were all pretty tired as we got to the end of the 15 races. After squeaking out one more race right before the 3PM cutoff time, we headed back to shore and back to Penn, pleased with the way that we had sailed. The highlight of the regatta was Jack and I finishing 5th in A division at a major intersectional, our best individual finish this year! Thanks to the Harding family for hosting us and feeding us this weekend! Always appreciated! On Friday night Caroline Garth, Joe Egan, Alexia Tragakes and I packed into Caroline’s car and set off for her delightful suburban New Jersey home. Fueled by a tasty carbonara carbo-load from the night before, the team arrived at Toms River Yacht Club on Saturday morning for the OCC Spring Open. As all 18 boats headed out for the first race, conditions were challenging with steady wind around 20 mph gusts up to 30. When 6 boats capsized in the first race of Division A, the race committee called a postponement to wait for the wind to die off. By 11:30 winds were steady at about 18 mph with puffs to 23 mph, and racing resumed. Thanks so much to Mr. and Mrs.Garth for hosting us and serving so much delicious food!  The MAISA Team Race Challenge last weekend was Penn’s third and final team race of the spring season, marking a significant improvement in performance over the previous two team race regattas. As the qualifier to the Prosser Trophy, the qualifier for Team Race Nationals, the stakes this weekend were higher, but we were ready to take the challenge. Senior Jack Swikart, freshmen Drew Gallagher and Joe Egan skippered, while senior Pati Andrade, junior Foster Collins, sophomores Catie Hopkins and Cary Kane, and freshman Max Joyce crewed. Saturday was uneventful as 25-35 knot winds with gusts up to 40kts necessitated an immediate AP, which was eventually followed by the abandonment of racing for the day. The start time for Sunday was moved up, and racing started at 0915. Wind was light and variable from the West/Northwest, but built as the day progressed to cap off at 15-25 knots. The first round robin was completed with an hour to spare before the 1500 deadline, the results of which saw Penn in second place. 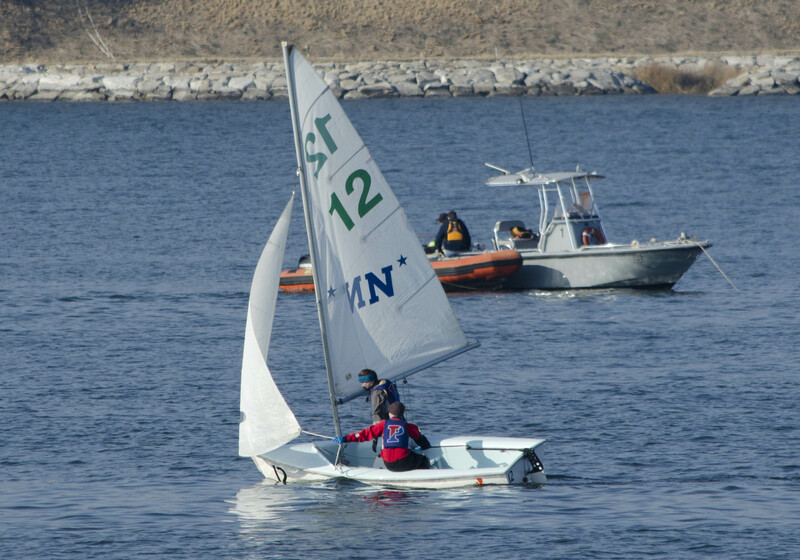 Despite the time constraint, the Race Committee attempted to sail an additional round robin for the final four, but was unable to complete even four races before the deadline. After a day of great racing, we were very pleased with our performance over the last few weeks. Final results were taken from the original round robin, but unfortunately Penn and GWU met in the unfinished final four with GWU winning. This race counted for a sail-off and resulted in Penn falling to third place, and not qualifying for the Prosser berths. However, we all felt very accomplished with how well we’d sailed and how much we’d improved in the past few weeks. We had another great weekend at my house, and thanks to Catie for driving her car all weekend so we could fit a full squad! 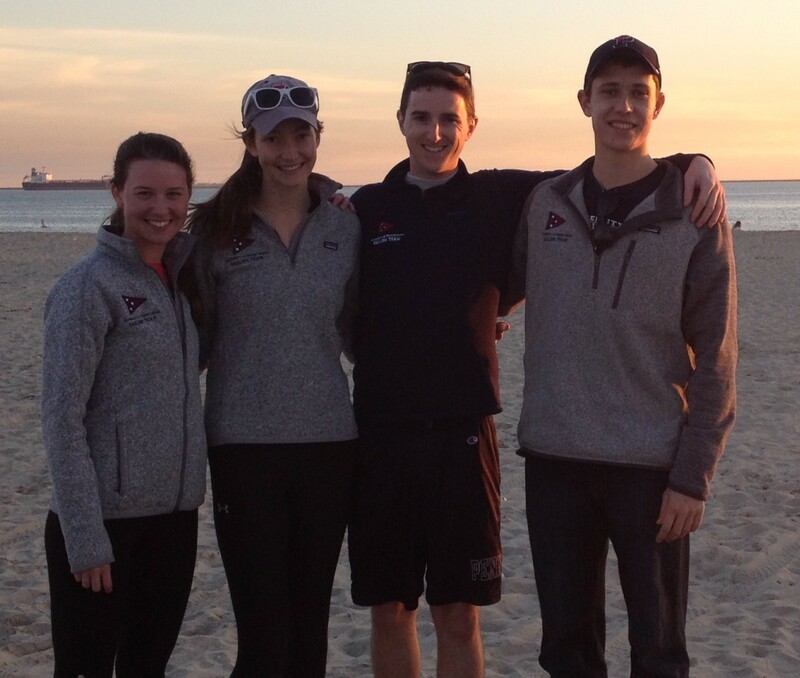 Welcome back from the Penn Sailing Team! 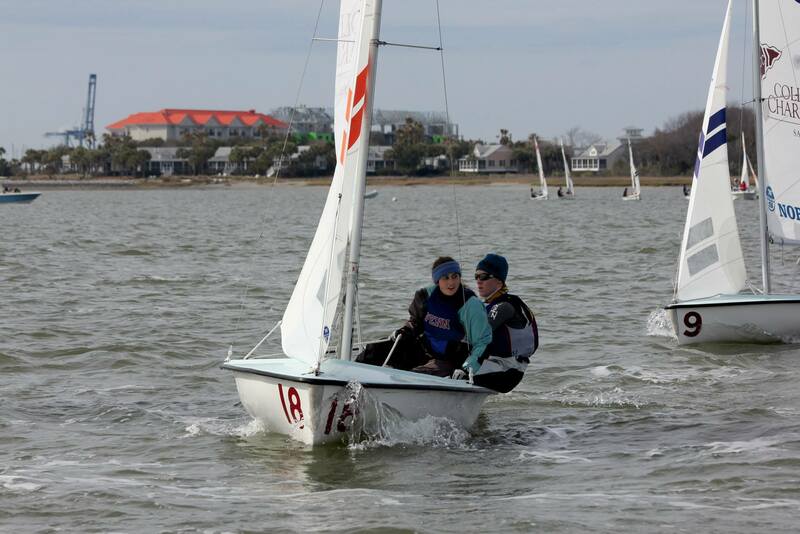 Last weekend, we officially kicked off our spring season with a regatta hosted by the College of Charleston. On Friday night, Jack Swikart, Patricia Andrade-Chevres, Drew Gallagher, and I boarded a plane with four penguins painted on the tail and wing-tips to leave snowy Philadelphia on Penn’s first ever flight to an in-season regatta. Our itinerary had us fly into Charlotte, N.C., then drive to Charleston before finally arriving at our hotel around 1:00 a.m. The next morning began a little slowly as we were all exhausted. However, after rushing to ready for the regatta, we gained a reprieve as the racing was postponed due to lack of wind. The team lounged outside, enjoying the comparatively warm weather, until a light South East wind filled at 1300. Jack and I were racing in FJ’s, while Pati and Drew tackled the 420. After only 4 races each, disrupted by 2 more offshore postponements, the racers were towed ashore slightly disappointed at the conditions, but having enjoyed a day of sailing and team bonding. After a delicious dinner at a trusted Outback Steakhouse, we retired to the cozy home of Brooks Carpenter, the son of Chip Carpenter, Penn C’78. Sunday began with a bit of anxiety as our car’s battery had died over night. With the help of some wonderful neighbors and a set of cables, we were able to start our battery and get to Charleston in time for the harbor start. The conditions were a little better than Saturday, with a slightly stronger west wind that switched to southwest several times. As is typical at big intersectional, A and B fleet switched boats for the second day. Drew and Pati took on the FJ and finished 4th in the first race of the day, as Jack and I turned to the 420, finishing top 5 in each of the day’s 6 races. Around 1430, the wind shifted south and died, forcing race 11B to be abandoned (B fleet had already abandoned two other races earlier that day). Having finished 11A, the RC sent the A fleet to drift in as the B fleet attempted to begin another race with a hoped-for wind shift. This race was ultimately abandoned as well due to poor conditions and a dying breeze. We performed well in our first weekend back on the water, ending the regatta in 6th overall, and just beating out Boston University on a tiebreaker for the top club team spot. We are incredibly grateful to Charleston’s understanding sailors and coaches who ensured that they towed us to shore in time for us to make our flight, as well as to Navy’s A sailors who helped us de-rig our boat. And of course, a huge thank you goes out to Mr. Carpenter, who helped us organize our stay with Brooks, and to Brooks himself, who welcomed us into his wonderful home. The team was very excited to be back on the water and looks forward to getting our own boats in the (currently icy) Delaware River soon! 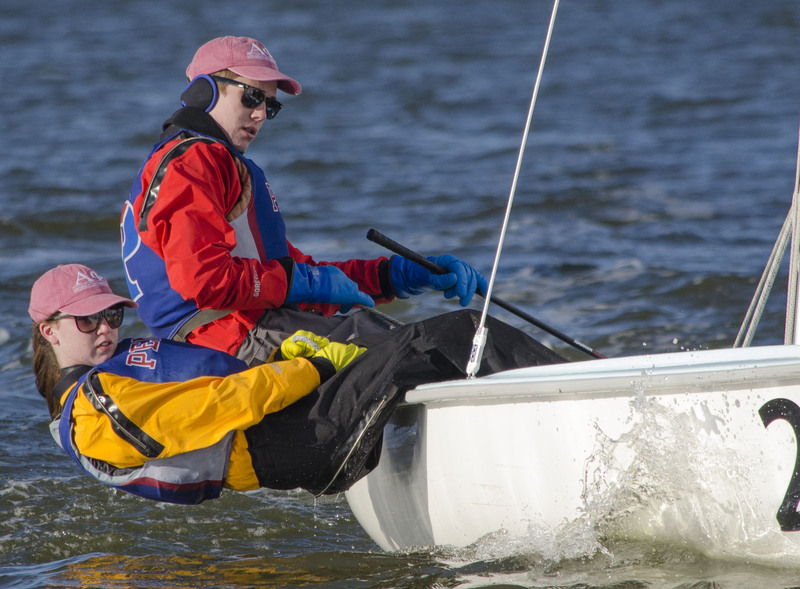 For the first time ever, the Penn Sailing Team competed in the Rose Bowl Regatta over winter break. The Rose Bowl Regatta, much like it’s namesake college football game, takes place just after New Years in Los Angeles, CA. 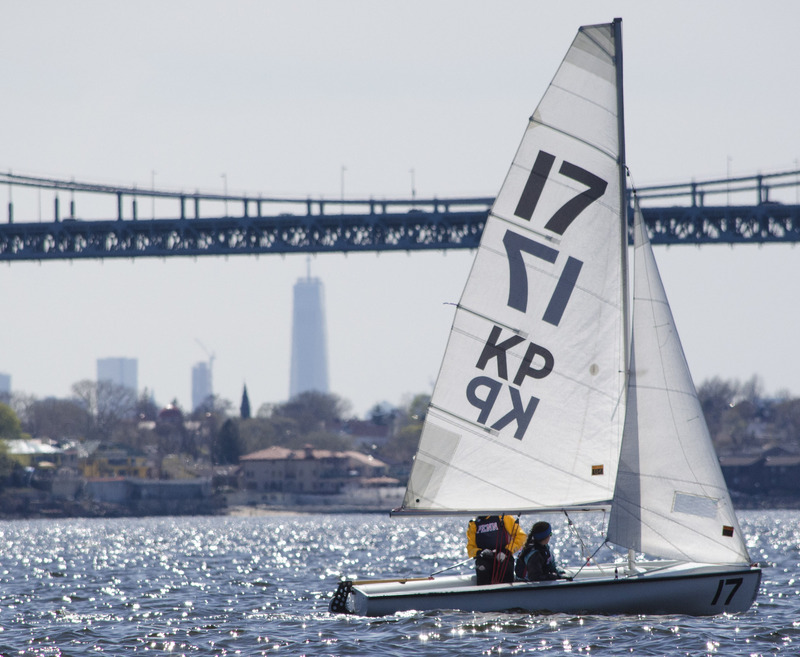 Four members of the team flew out to enjoy the weather, improve our skills, and increase our team’s visibility to the high-caliber west coast high school sailors. The weather was sunny, warm, and a light southwest sea breeze filled in each day right around noon. There were occasional shifts, but the breeze was more about pressure than angle. 32 colleges competed in this event to make it the largest fleet I’ve raced against in college sailing. Because of the size of the fleet (30 boats), there was a greater emphasis on starts, mark roundings, being conservative, and keeping a clear head. The favored end of the line usually had a significant pile-up and any given mark rounding could get messy, so keeping clear and sailing our own race was important. Starting a little off the favored end to get a clear start and getting a clear lane through the racecourse allowed us to get fairly consistent results. The size was also a bigger factor in bad races. In one race, Cary and I had to spin early so we rounded the windward mark third to last. We sailed our own race and kept ourselves clear which allowed us to catch ten boats and turn a very bad race into an okay race. This was Carolyn’s second regatta as a crew and my first double-handed regatta in general, so the learning curve was steep. On Friday, Jack thoroughly went over the full process of tacking while Carolyn and I sailed and practiced the mechanics. Carolyn and I saw quick improvement after an hour of tacking drills. As the regatta progressed muscle memory started to kick in and by the end we were able to tack well somewhat consistently. My feel for the upwind boat speed steadily improved and Carolyn and I finished the regatta with our best set. This was our first time to Rose Bowl as a team and the recruiting aspect was pretty unique. The college night was packed and Jack gave a good speech during his 90-second allotment to introduce us to high schoolers, but most of the recruiting was done on our own time through talking to parents, coaches, and sailors. We shelled out a ton of Penn Sailing Business cards and faced a lot of anticipated comments like “Is that Penn State?”, “is that the Ivy?”, and “wait who?”. We talked to sailors ranging from curious underclassmen to juniors and seniors who were considering applying or had already applied. Ultimately, we improved a lot and left a footprint in a region where we previously were pretty much unknown. We had a great time and learned a lot, and we definitely hope to be back next year! Also, thank you very much to the Romm family for graciously hosting the team during our stay in California.